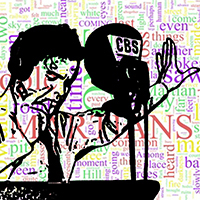 Even if you don’t specialize in communications, you probably have at least heard about Orson Welle’s famous live reading of the “War of the Worlds” by H.G. Wells, and his audience’s response. Welle’s adaptation and reading of “War of the Worlds” was so realistic, it caused mass panic in his listening audience, many of whom believed that earth was really under attack by aliens. As a result of the impact that Welle’s reading had, the broadcasting world suddenly became more aware of their potential to influence, and many communications theories were born. Paper # 122233, “The Impact of the Panic Broadcast of “War of the Worlds“, is this week’s Paper of the Week on AcaDemon and it examines these theories and the audience response to Welle’s Oct. 30, 1938 reading. The paper provides a fascinating account of a period when the impact and influence of broadcast radio was just beginning to be understood as well as the communications theories that emerged as a result of that broadcast. In short, this paper provides great background and insight into our current understanding of the study of communication.